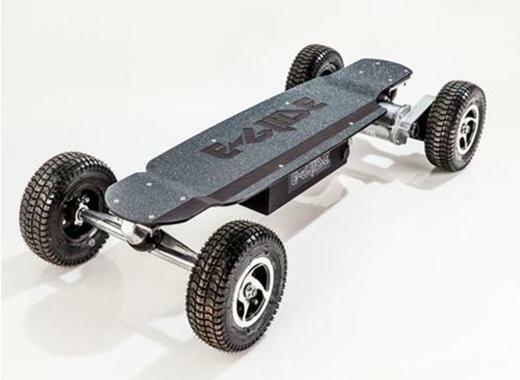 The GT Powerboard is our best seller, hands down. This board does it all. The combination of the "dropped" .25 inch aluminum deck, and low profile Kenda pneumatic tires, provides a low CG (center of gravity) that feels perfect. The "rise" at the deck ends permit a place to brace against the extreme acceleration and deceleration this powerboard can produce. The deck flexes for a ride that feels "alive", with uncompromised smoothness. The GT is just plain “overpowered”, our customers are always surprised by its brutal acceleration and torque, steep hills and broken terrain are no challenge, this is a serious machine. The GT can be used on concrete, grass, dirt, snow, and hard packed sand. It will go over just about anything, it can transverse rough and broken surfaces at speed. This board has plenty of clearance and the motor is tucked up high. The GT’s awesome power is generated by 70 amp “industrial grade” electronics manufactured for us by Curtis Wright. Power is transmitted through an oversize drive belt which provides quiet, maintenance free operation. With a deck that will last 500 years, no one comes close to producing such a bullet proof and reliable powerboard. Built in our shop since 2004. 0-23 MPH in four second performance! STATE OF THE ART"Industrial" grade 70 amp Curtis Wright electronics provides and insures trouble free reliability. No other electric skateboard offers such world class electronics. Batteries (Standard three 12 volt 12 amp high discharge sealed lead acid batteries, which normally last 2-3 years/about 250charge cycles. UNREAL POWER, torque and speed, this powerboard is SCARY! SIMPLE, DURABLE, RELIABLE DESIGN, easy to work on, troubleshoot, and replace parts.